It should come as no surprise to anyone reading this article that I am convinced our Catholic schools provide quality education for all who attend them. Committed to the education of the whole person, they provide more than outstanding academic programs. 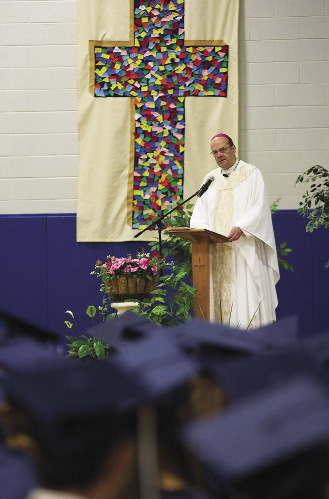 Our Catholic schools remain the best vehicle for handing on our Catholic faith, forming disciples of Christ and preparing exemplary citizens of our great country. Studies have been conducted, articles written and speeches delivered about our Catholic schools’ academic programs and faith-based education. Many, however, may not be aware that service is an essential component in our Catholic schools. You may recall from St. John’s Gospel the account of Jesus washing the feet of His disciples. This gracious gesture has been captured by numerous artists throughout the centuries and is proclaimed each year on Holy Thursday. This annual retelling of the washing of the feet reminds us that we are all called to serve others. “If I . . . have washed your feet, you ought to wash one another’s feet. I have given you a model to follow, so that as I have done for you, you should also do” (Jn 13:14-16). We have a special responsibility, rooted in our baptism, to act as Christ acted. The Gospels make it clear that Jesus was concerned about the physical and spiritual well-being of others. He teaches us, on more than one occasion, that an authentic love of God requires love for others. To care for the neighbor is to care for Christ. And our eternal life depends upon this attention or lack thereof. “Whatever you did for one of these least brothers of mine, you did for me” (Mt 25:40). Pope Benedict XVI reminded us in his first encyclical letter, Deus Caritas Est, that there are three constitutive elements to the Church’s mission: the proclamation of the Gospel, the celebration of the sacraments and the responsibility to reach out with love and care to our brothers and sisters in need. This lesson of service is taught, by word and example, throughout the course of a Catholic school education. As you read this article, perhaps you can travel back in time to those days when you learned the spiritual and corporal works of mercy. I still remember learning them in school; memorizing them and being encouraged to practice them by my dedicated teachers. The works of mercy give us very practical actions by which we can reach out to our neighbors, especially, but not exclusively, the neediest among us. The very names “spiritual” and “corporal” works of mercy remind us that our concern for others should address the totality of the human person. We are concerned about the bodily and spiritual needs of our brothers and sisters. Our children are not only taught the corporal and spiritual works of mercy. They are actively engaged in feeding the hungry, clothing the naked, visiting the sick, giving alms to the poor, comforting the sorrowful, instructing the ignorant and other activities which reach out to others. In our Catholic schools, practicing the corporal and spiritual works of mercy takes many forms: regular visits to nursing homes; the collection of food for the needy; kindness shown to a student who is sick; assistance given to foreign missions; high school students helping younger students in tutoring; participating as an aide in parish religious education programs; praying for those who have gone before us marked with the sign of faith. 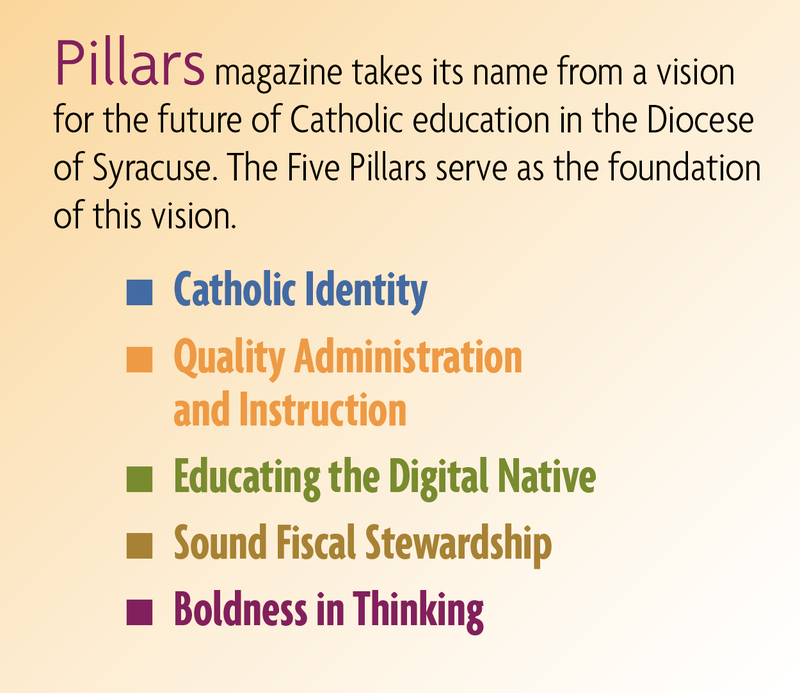 This edition of Pillars is scheduled for publication in January, the month in which the annual celebration of Catholic Schools Week occurs. 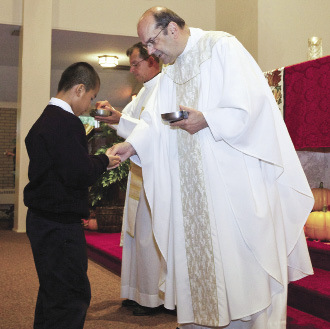 The theme for Catholic Schools Week 2012 is “Catholic Schools: Faith. Academics. Service.” This theme focuses on the three priorities that Catholic schools establish that make them stand out from other educational institutions. Our children are taught faith — not just the basics of Christianity, but how to have a relationship with God. Academics, which in Catholic schools are held to very high standards, help each child reach his or her potential. Service, the giving of one’s time and effort to help others, is taught both as an expression of faith and good citizenship. When our Catholic school students give their time and effort to help others, they are putting their faith into practice and living their call to discipleship. By so doing they will most likely experience the satisfaction and joy that often accompanies good deeds. At a deeper level, however, our students are acknowledging the inherent dignity of the human person, made in the image and likeness of God. As they bring Christ to others, they recognize Him in those they serve. Each and every year our Catholic school students provide service in so many ways. By so doing they convey the fundamental message of love for God and neighbor. May it always be so!